THREE RIVERS — Emmy Award-winning children’s band and former Disney Junior stars Imagination Movers will be performing at the Riviera Theatre in Three Rivers on Sunday. Imagination Movers, based out of New Orleans, are best-known for their Disney Junior show of the same name that ran on the channel between 2008 and 2011. Imagination Movers member Scott Durbin said the band is looking forward to playing in Three Rivers. “One of the reasons we’re coming to Three Rivers is because we found this wonderful theatre, the Riviera Theatre, and thought it would be a good place to see how many people would come that might be interesting in coming to see us,” Durbin said. Imagination Movers, who celebrated their 15th year together back in June, was born our of Durbin and his friends Rich Collins, Dave Poche, and Scott “Smitty” Smith’s experiences watching television with their kids back when they were younger. “When we started, whenever you have kids, you’re born into children’s programming, and we didn’t see a lot of real people on children’s programs,” Durbin said. Durbin said the idea of the show was to be music-based around modeling teamwork and problem-solving, while also giving kids a strong male role model. The idea caught on early with local broadcasters, and eventually Mickey Mouse came calling. The series ran for three seasons, with re-runs airing until 2014. Durbin said they were thankful for Disney believing in them. Since then, the group has done weekend tours in areas that Durbin said the Imagination Movers didn’t go to that often when they were with Disney. They have also done shows for military families abroad in Asia and Europe. “Doing those shows for the military families have been a great part of our post-Disney career,” Durbin said. Durbin said that people can expect a lot of action during an Imagination Movers show. “We try to not dumb down material. We try to challenge and encourage kids to aspire for being creative and independent and being problem solvers,” Durbin said. Speaking to interactivity, Durbin said the line between them and the stage during a show is usually broken. 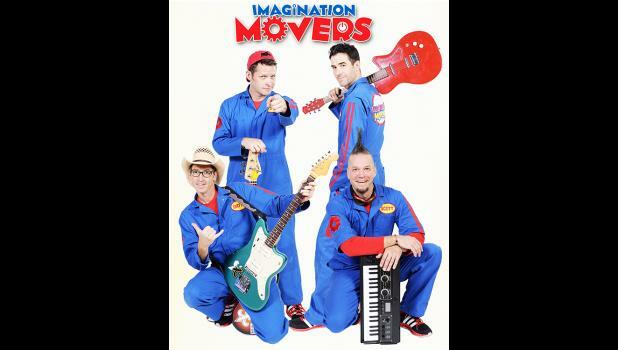 Imagination Movers will perform Sunday, March 31 at 1 p.m. at the Riviera Theatre. Tickets start at $20, and meet-and-greet passes are available for an additional $30. Tickets can be purchased on the Riviera Theatre website or at Brown Paper Tickets.